Summary: Solar shingles blend in with regular asphalt shingles and are less noticeable than solar panels. Carl, I note there are solar panels that are similar to roof tiles and appear to be part of the roof and not the present unsightly solar panels. Do you have the manufacturer of these solar panels? I believe you are referring to solar shingles. Solar shingles transform sunlight into electricity just like solar panels do. Solar panels are very visible while solar shingles are not. 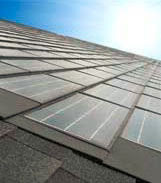 Many people do not like the appearance of solar panels because they are too visible. They may be in favor of solar as a source of alternate energy as long as it blends in aesthetically. Solar shingles solve the aesthetic problem of solar energy. Are more impervious to hail. Allow for optimum roof placement. Install like a conventional shingle!